18kt yellow gold case with a 18kt yellow gold Rolex oyster bracelet. Bi-directional rotating 18kt yellow gold bezel. Silver dial with gold-tone hands and Roman numeral hour markers. Dial Type: Analog. Luminescent hands and markers. Date display at the 3 o'clock position. Rolex calibre 9001 automatic movement with a 72-hour power reserve. Scratch resistant sapphire crystal. Screw down crown. Solid case back. Case size: 42 mm. Round case shape. Water resistant at 100 meters / 330 feet. Functions: GMT, second time zone, month, day, hour, minute, second. Additional Info: 24-hour display on off-centre disc, month display via 12 apertures around the circumference of the dial. Luxury watch style. Watch label: Swiss Made. 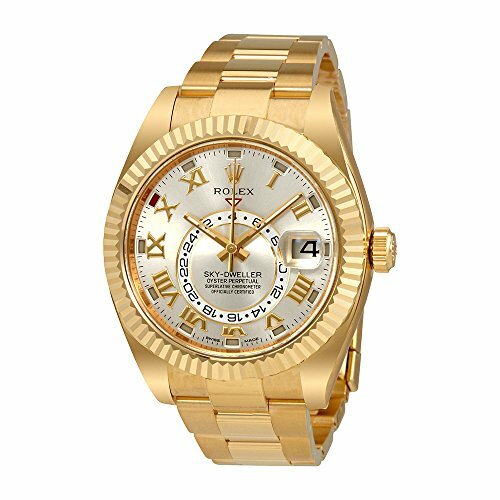 Rolex Sky Dweller Silver Dial 18 Carat Yellow Gold Oyster Mens Watch 326938SRO.